I recently joined a baking club, and I have to say, it’s pretty dang fun. My friends and I pick a category, master a recipe, then bring it to a gathering where we get to taste and judge each “submission” (hello, excuse to eat copious amounts of dessert), give out awards in various categories, and – of course – enjoy one another’s company. The last couple of years, I hadn’t baked as much as I used to. But the baking club has really helped to re-ignite my love of baking. March’s category was cupcakes. I earned, ahem, last place in the previous competition (s’mores bar cookies. Let’s not speak of it.) So I was determined – in a light-hearted way – to win this one. Or at least, not to lose! 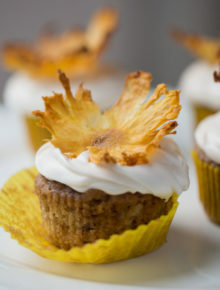 So I narrowed in on these bad boys: Hummingbird Cupcakes. 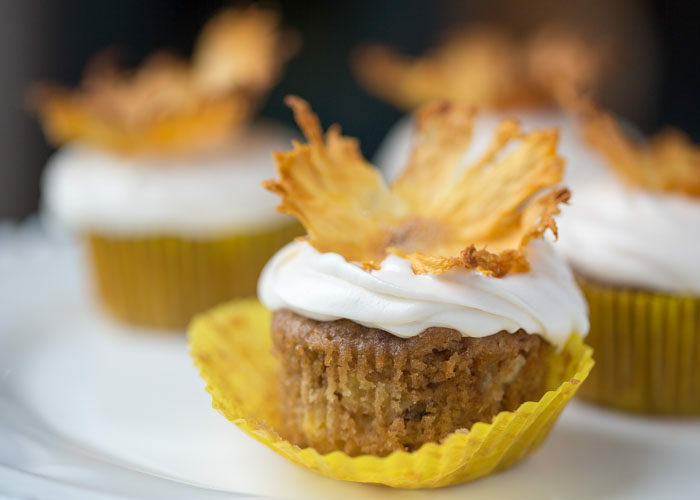 Do you know about hummingbird cake? If not, you want to. I promise. Hummingbird cake was first really popularized back in the 70’s, I believe, when it was published in an issue of Southern Living magazine. A moist, spiced cake with banana, crushed pineapple, and nuts, it’s reminiscent of carrot cake, except you’ve got bananas instead of carrots. In this version, I added coconut too. Because life always needs more coconut. 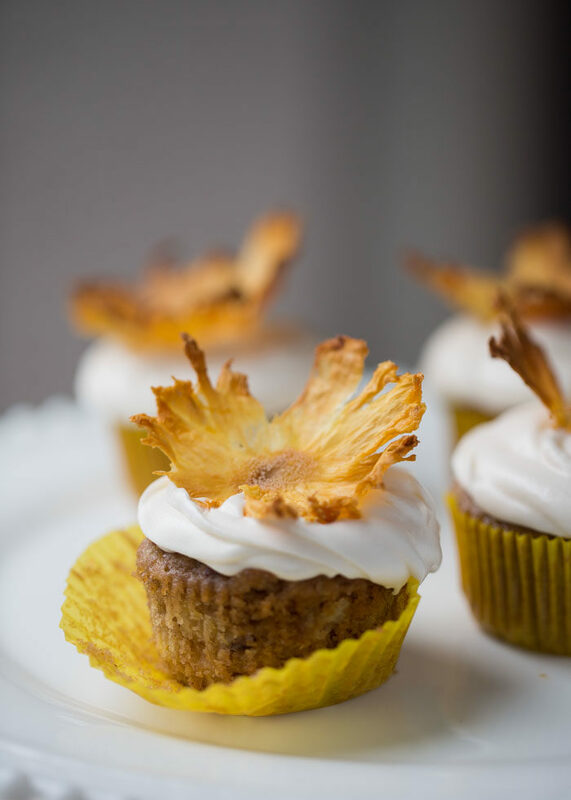 Hummingbird cake is typically topped by a sweetness-cutting cream cheese frosting, and the combination is perfection. The icing on top of the icing?! 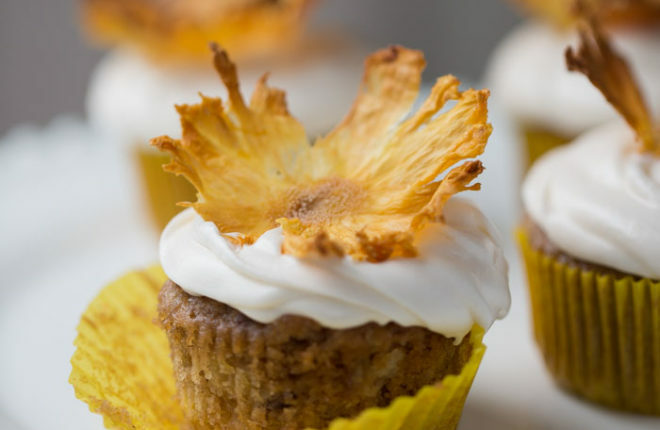 A perfectly dried pineapple “flower” – the crowning glory of these hummingbird cupcakes. 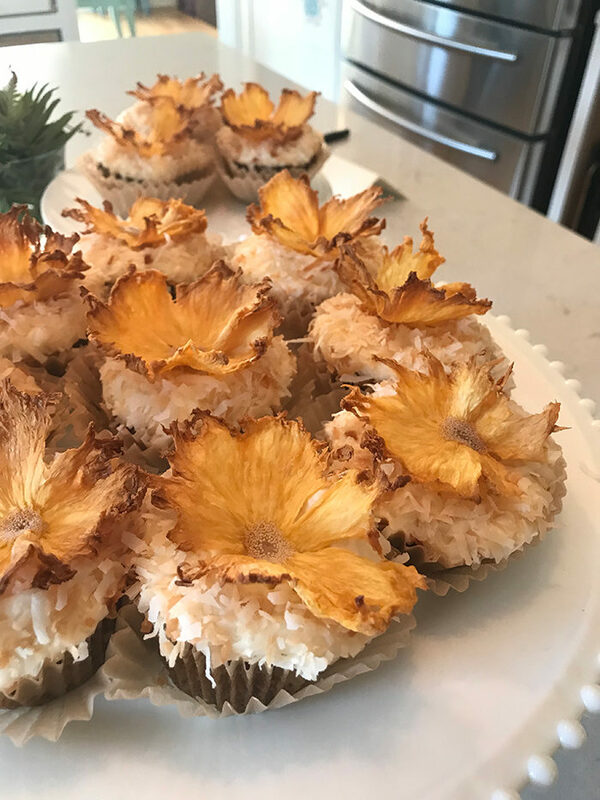 For our baking challenge, I rolled the frosting in toasted coconut before topping with the flower, which was pretty (and tasty) but not necessary. I can’t even count how many times I made this recipe in order to perfect it. So, did I win the baking challenge? NO! I didn’t! My friend Cristina brought the most perfect carrot cake cupcakes with an insanely delicious brown sugar buttercream frosting. They deserved to win. But my Hummingbird Cupcakes earned second place with extra points for presentation, so there’s that! 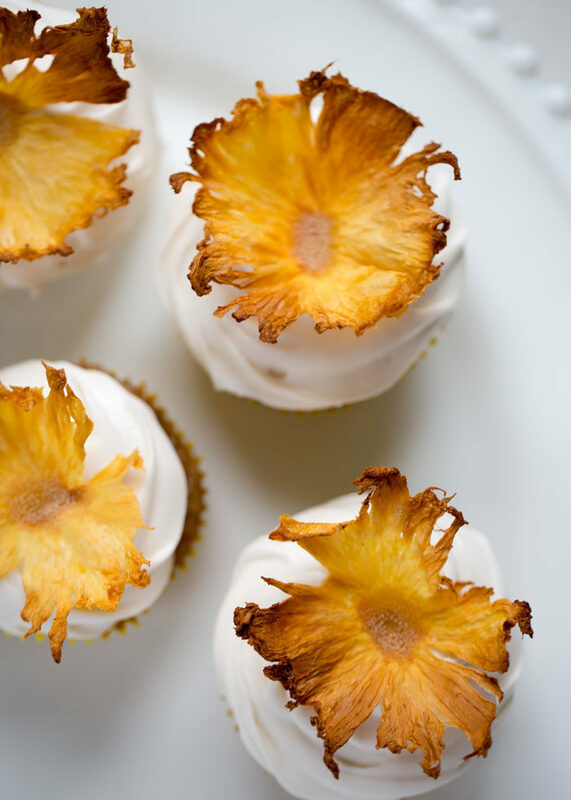 Pineapple flowers for the win! Anyway, if you’re a dairy-free type like me, the cake recipe is made with vegetable oil – so no dairy whatsoever. The frosting, on the other hand, well – it’s cream cheese. But you can make a dairy-free version with vegan cream cheese and vegan butter that’s not too shabby. See the notes section of the recipe for more info. Preheat oven to 350 degrees Fahrenheit. Line a standard, 12-cup cupcake tin with liners. In a large bowl, mix together the flour, sugars, baking soda, cinnamon, nutmeg, and sea salt. In a medium bowl, mash the banana. Add the oil, egg, vanilla, pineapple, and coconut and mix thoroughly. Add the wet ingredients to the dry ingredients and stir just until mixed. Fold in the pecans. Bake until the tops spring back when pressed and a toothpick inserted into the center of the cupcakes comes out dry, 18-22 minutes or so. 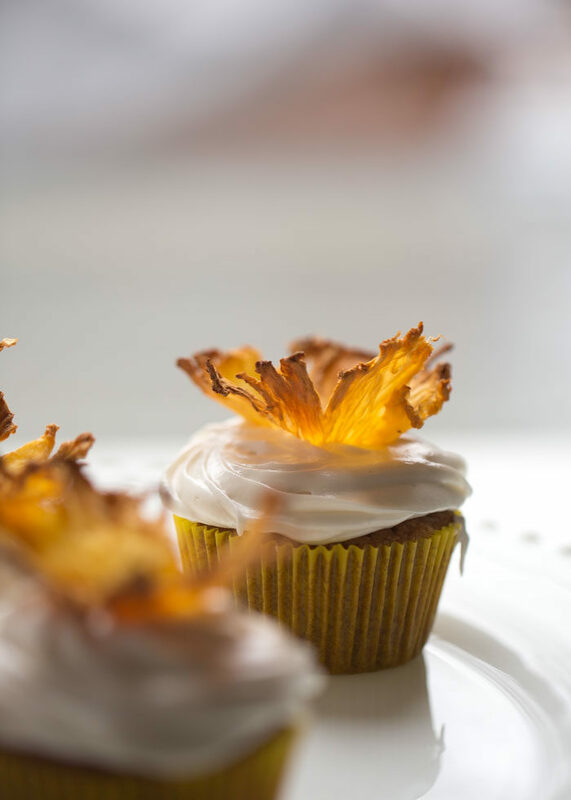 Remove cupcakes from oven and let cool completely. To a medium bowl or to the bowl of a stand mixer, add the cream cheese and butter. Mix with hand mixer or stand mixer until combined and a bit fluffy. Gradually add the powdered sugar and continue beating until fluffy, 3-4 minutes. Mix in the vanilla. Frost cooled cupcakes. You can do it simply with a knife or pipe with your favorite tip. Keep refrigerated until ready to serve. 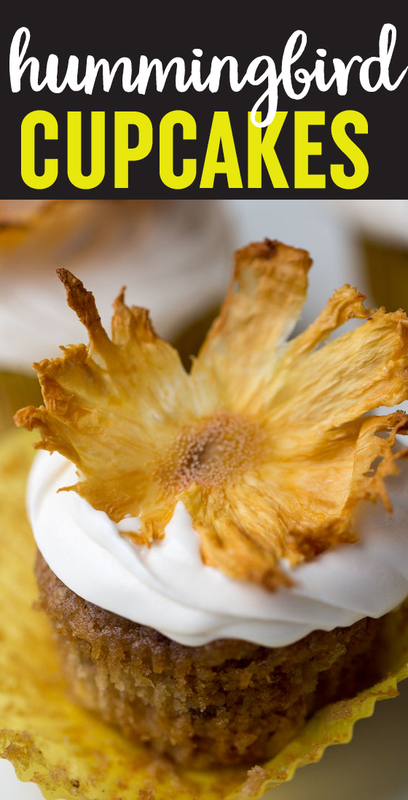 Top with pineapple flowers, if using, right before serving. For dairy-free frosting, swap in vegan cream cheese and vegan butter (I use Earth Balance). Depending on the brands you use, your frosting may end up wetter than if you use traditional ingredients. Sift in more powdered sugar until your frosting reaches the consistency desired.